How is it already September 1? I’ve never before in my life wished for August to end, but this year has been different. I wonder, can a simple flip of the calendar really make a big difference to one’s state of mind? I don’t know, but I sure am hopeful! Anyways, I thought I’d share another slightly funny thing about how August fizzled out for us. Those who know us, know that Mr. MPB loves to cook and could probably be a chef if his current career ever falls through. (I sure won the jackpot with him – I’d live off Kraft Dinner if I had to fend for myself). Monday we got home late from camping and had no food in our house. We made pasta for Little MPB and ordered pizza for the adults after Little MPB was in bed. Tuesday Little MPB had left-over pasta and we ordered Indian food (we just found an amazing take-out place but it is way to spice for Little MPB). Wednesday I finally went grocery shopping because the food situation had become pretty desperate. While shopping I decided I really wanted barbeque ribs for dinner. So, Mr. MPB started slow cooking the ribs at about 3pm (a benefit of working from home). We had the BBQ set to approximately 200f for a few hours – they were looking great! 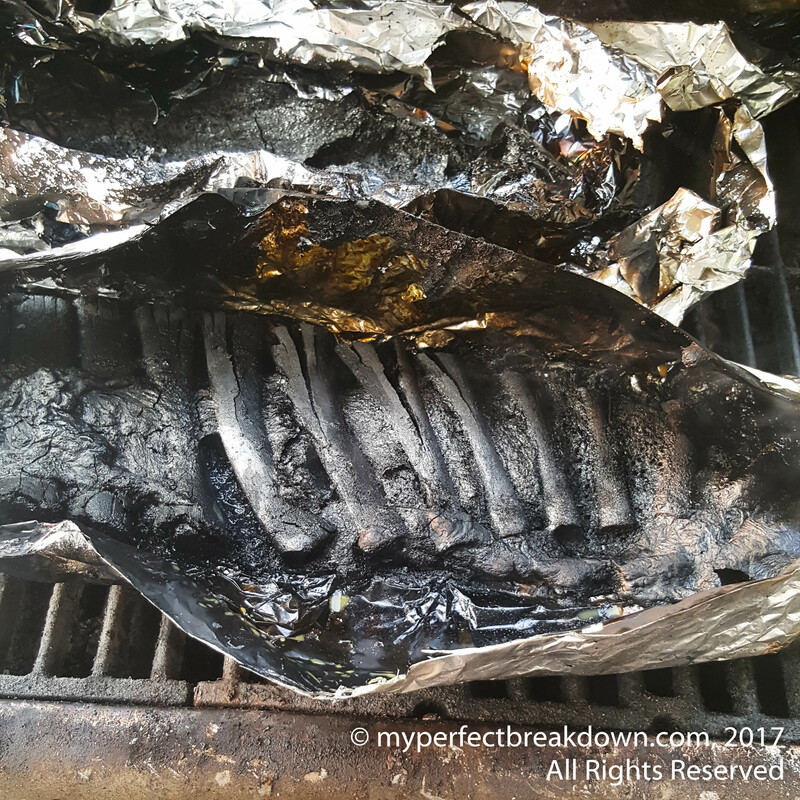 Mr. MPB decided to give them a bit more time, and he went back about an hour later and the BBQ temperature had raised to 750f and the ribs were literally on fire!! Needless to say, we put out the fire, then scrambled to put dinner together for Little MPB and ordered pizza again for the adults way later then we would have prefered. Thursday was no better. We all had left over pizza. We normally eat-out or order take-out no more then 1/week. Needless to say, neither of us are loving the amount of pizza we’ve eaten this week! It’s amazing how quickly we start to feel sluggish and generally yucky when we eat poorly. Mr. MPB seems fully committed to this little self-imposed challenge. I on the other hand, have not volunteered to help him with the cooking. Instead, I’ve promised that I’ll eat his home cooked meals every single night and that I’ll take photos of said meals! If we both hold up our ends of the deal, I’ll share the photos (good and bad) and recipe ideas. I know, right?!!! Every time I see the photo I’m still shocked at how destroyed they were! Oh my goodness….that escalated quickly, didn’t it??? Our BBQ is unpredictable too…so I have never mastered slow cooking on it. Have you ever tried a smoker? They make AMAZE-BALLS ribs, and it’s super easy. Mr. Big does has never liked to cook in the 8 years I’ve known him – but early this year he seasoned a dish for me while I was doing something else and it turned out amazing. Since then, he’s seasoned multiple dishes – each turning out perfectly (it’s like he’s a seasoning ninja or something, but don’t tell him I said that he’s already strutting around like a peacock over his latest stew). He’s become much more interested in cooking and has tried a couple new recipes that have all been keepers. I’m excited to see what Mr. MPB comes up with and try some of it! It escalated so quickly!! We definitely didn’t expect that to happen as it’s never happened before. Oh well, live and learn, I guess. We haven’t tired a smoker. Maybe that should be Mr. MPB’s birthday gift (I’ve been struggling to come up with a good idea)?? Any suggestions on what brand to buy? I love that your Mr. has a knack for seasoning the food! That’s a great skill to have! 🙂 I have a knack for completely forgetting to season things, so Mr. MPB does almost all the food seasoning in our house too. We have the smokehouse big chief front load from Canadian Tire and it has been wonderful – easy and delicious. My only complaint is that you can’t use it in the really cold winter outside…it should be in a garage in the winter. Other wise it’s a win…I’ve heard good things about the Masterchef smokers too although I’ve never used one. Maybe you can make a few on the weekend to be organized during the week? (I say this and laugh because I so don’t have the time/motivation to be that organized). Oh my gosh! You did hit the jackpot. I don’t think walt has ever cooked. Anything. Have fun with the challenge! Can I come for dinner?! Oh no!!! There is nothing worse than spending that long on an amazing meal… smelling the delicious smells, and then having something happen!!! I can’t believe in that short amount of time, the grill just got up that high!! What kind of a grill is it? And I completely agree on feeling bad when you eat bad. I was just telling B about this the other day, and since moving we have had a lot of pizza too… but finally getting back to being able to cook in our own house again! I like the challenge. I would like to try it as well… but I already know I will fail. Mostly because we got some good coupons for moving. And they have an expiration date. 🙂 So I will have to find a way to modify this challenge. We were also shocked at the temperature increase in about an hour. Completely unexpected! It’s a natural gas barbeque. I’d fail at the challenge too if we had good coupons waiting to be used. 🙂 Maybe you can try something like only eating out on weekends or after really long days at work? Your week sounds like our week, food-wise, which is unusual for us. I haven’t committed to every day in September, but certainly hoping to get back on track! Cheers! Having just begun to more carefully monitor calories, you’ll probably both lose 5 lbs even if you don’t need to! I’ve realized it’s restaurant prep that makes most of us a bit unhealthy:). Here’s to enjoying those homecooked meals! Wow! There is no way I could commit to that challenge but go Mr MPB! Omg that picture is amazing!!! Hahahahaha!!! How in the world did the temp get so high?? Thankfully B does majority of the cooking in our house, and I do the cleaning after. He’s more creative than me with food, and I have a higher standard of clean than he does lol. Good luck with dinner this month! Totally amazing! Normally I have such good food photos to post that I had to share this train wreck. hahaha! That’s an awesome challenge! I have been feeling a bit more sluggish this week and it’s totally as I slipped off the good food bandwagon. I need to get back to feeling good. I look forward to the pics for inspiration! There is nothing sexier than a cooking man lol. Go gurl !!! Oh, I really like this idea. I’m always up for learning new recipes! Oh my! Seems like the cooking gods turned their back on those ribs! Hope it’s going well since we’re a third of the way through by the time I read this!